An event design blog featuring event design, lighting and decor at events throughout NJ and NYC. Eggsotic Events is one of New Jersey's top event design companies. We provide lighting, props, centerpieces, custom creations, lounge furniture, and so much more. Our blog showcases our recent event designs, custom projects, and new innovations in event design. Over the past 20 years, we have developed relationships with many schools and non-profit organizations across New Jersey, New York, and Pennsylvania. We understand how important the yearly fundraising gala is. Uplights are powerful lights, with a huge range of color. They are traditionally placed around the perimeter of a room, creating a glowing effect of the entire space. Color choices for these lights can vary from one to many. They are also used to illuminate standing structures, props, entryways, and many other features and focal points in a room. Lighting for auction items is key for a successful evening. You’ve worked hard all year to source these items, and with so much riding on those bids, you cannot let them go unnoticed. Clean, subtle, and effective options like overhead wash lights and pinspots highlight the allure of every prize and prize table. It helps make sure guests find exactly what they’re looking for. Creative lighting is a huge wow factor. 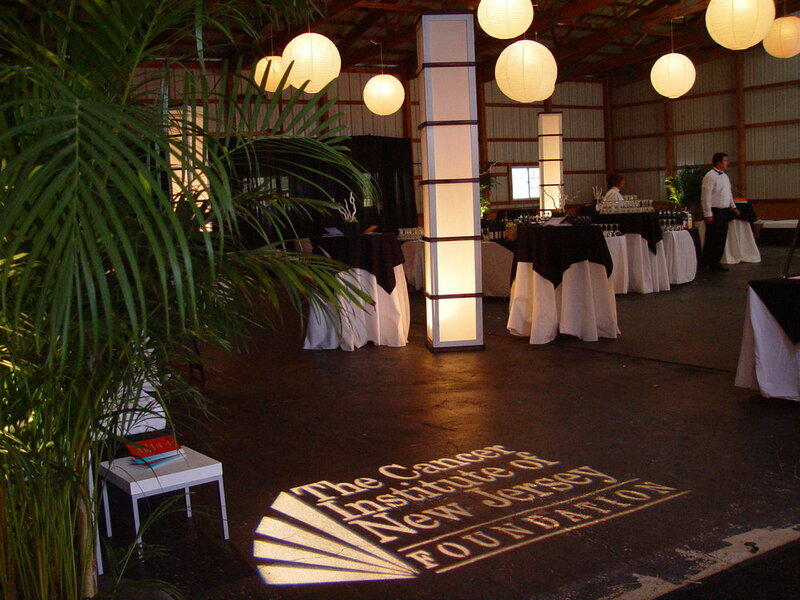 GOBO projections use a customizable template, shining light through to project images anywhere in the room. These can be thrown on to walls, dance floors, ceilings and more. Choose from stock patterns and effects or design your own. Lighting effects like this, as well as colorful patterns or laser light displays can be continually layered to add more and more drama. Other options range from simple colored washlights to illuminate the band or dancefloor to high end LED light displays. Find what fits your budget. A unique evening is a memorable evening. Make sure this year stands out from the rest. Choose a cohesive theme and decide where your budget is best spent. Where would you like guests to keep their focus? This may depend on the function of the evening. If this is a sit down sort of symposium, or if there will be presentations, perhaps spend more on centerpieces - a great reason for guest to want to stay seated and still engaged, as well as inspired. If the evening has more of a cocktail/grazing vibe, try sourcing larger decor items, or dividing the space into the direction you’d like guests to take. Decide what your goals are for the evening, and come up with a floor plan that can accomplish this. Maybe the flow of the tables, bars, stage, etc. all lead right back to the auction items. Find your focus and the guests will too. 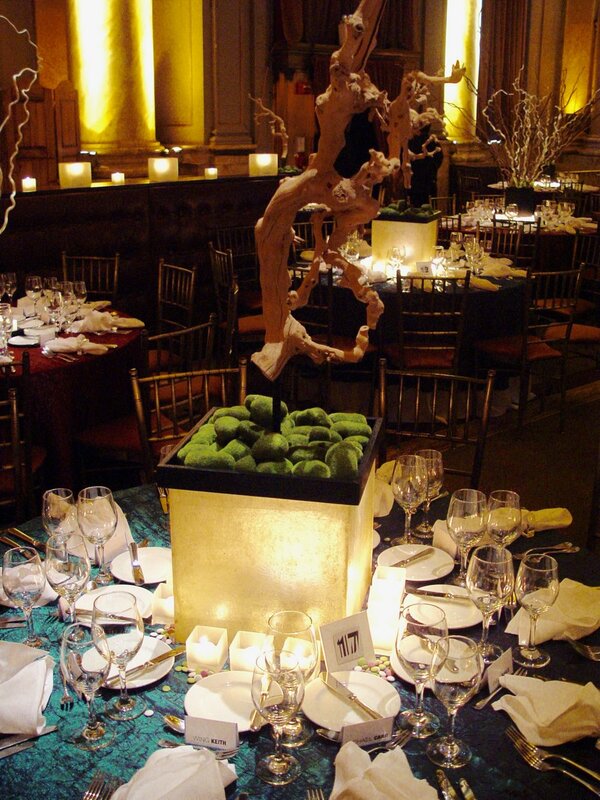 From elegant and simple to intricate layering, centerpieces keep the theme in mind all throughout the night. They are points of discussion that immerse guests into the evening and always entertaining. Don’t forget accent items for your bars, food stations, and auction tables. These can be informative or decorative, large or small. 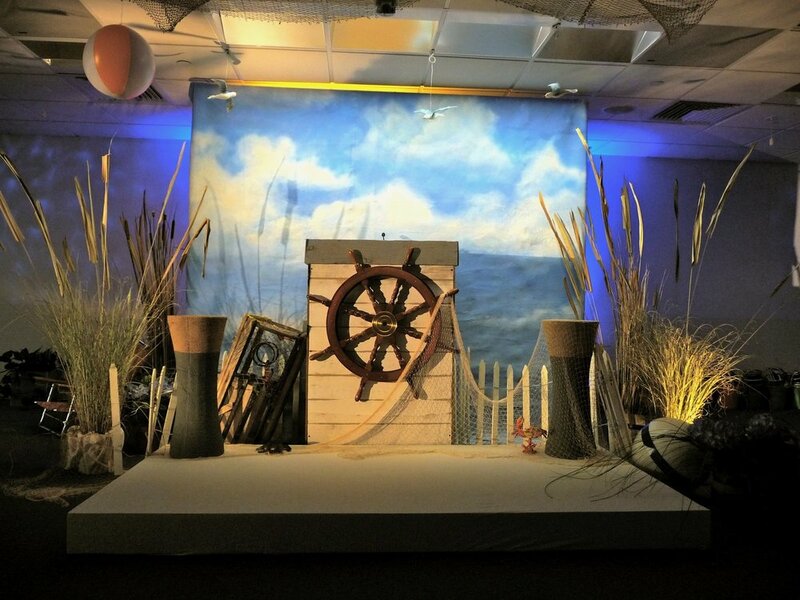 Depending on the event space, you may decide to utilize larger decor or props to build your environment. This can be very effective. Things like ceiling treatments and installations are impressive, one-of-a-kind and site specific. Sculptural elements are also great focal points and keep the theme. Will there be a stage set up at the event? How can you draw more attention to it? Even if you do not have a physical stage in the space, you can create the illusion by flanking the area both left and right with something eye catching. Bar rentals are smart, sophisticated and can be custom features at your event as well. Take a good look at your event space. How can it improve? Where will the focus be for the evening? Smart options like temporary drape walls and other structures can reinvent a room, hide unsightly features, and section off areas or create new ones. This is a great idea for behind a stage or podium. Backdrops do this as well and there are many options for drape in all colors, sizes, textures, and heights that can reinforce your theme easily. If you want guests to really hang out, look into renting some simple furniture and coffee tables, positioned correctly, it’s an instant lounge area. Don’t forget its called FUNdraising for a reason. The event is not just about supporting your cause, it’s about celebrating you and your team, and those that continue to support the efforts of your organization. Make sure your event is one guests will return to every year, eager for more. With good intentions come great things. Don’t forget that non-profits are about helping others, and ask for help when you need it. info@eggsoticevents.com or call at us (908)735-9870 for more information. One of our biggest projects thus far in 2015 is this fun, beautiful rehearsal dinner in the countryside of Far Hills, New Jersey. Eggsotic provided centerpieces, linens, tent pole decor, lighting, foliage and more for this celebration for 225 guests. Since the end of June is the week of the summer solstice, this party took place on one of the longest days of the year. This presents a fun design challenge: to create a look that works beautifully in both the daytime and nighttime. It was an absolute pleasure collaborating with this Far Hills event planning dream team: Shelley Ryan of SBR Event Design and Coordination and Louis and team of Prestige Party Rental. Cheers to many more events together! In our last post, we mentioned that many of our bar and bat mitzvahs have a "Favorite Things" theme. We love designing parties that convey the celebrant's favorite hobbies, colors, and more. We've worked extensively with Lori, Jillian's mom, who has planned fundraising galas for several years. She's done a wonderful job creating memorable, elegant events in the past, so of course Jilly's bat mitzvah was no exception. We partnered with Laura of Laura Clare Designs and Carissa and her team at Stone House to create a one-of-a-kind celebration of all of Jilly's favorite things. For the ceremony, Jilly wanted a sophisticated outdoor setting that reflected her love of nature. We used our handmade birch wall backdrop and created a custom birch torah table, which at 5' x 5' makes a beautiful focal point in front of the birch wall. We lined the aisle with our pewter lanterns, which held our handmade birch wood candle holders. Simple touches, like reusable natural candle holders and eco-friendly soy tealights, added to the environmental preservation theme. We also hung mason jar candle lanterns from the tree and used our battery-powered LED uplights to illuminate the trees in the ceremony area. The cocktail hour was held in the tent adjacent to the ceremony area. Since the guests would only be in the tent for a little while, we kept the lighting design simple. Amethyst purple uplighting and pin spots for the food stations made the cocktail tent look cohesive with the rest of the event. Laura Clare's tabletop lanterns completed the look. The reception lighting was bold and elegant, with purple and green uplighting and pin spotting for the centerpieces. We used live trees and ferns to create an organic feel. We framed the kids' lounge area using ivory drape and portraits of Jilly. It was accented by Jilly's name in moss, provided by the client. For entertainment, the family selected a photo booth, silhouette artist, and lots of games. We commissioned an interactive portrait artist to do live interactive painting. Jilly selected an inspiration image, our artist Marcelo created a foundation for the painting, and guests joined in throughout the party to add to the canvas. It turned out absolutely beautiful and makes a great keepsake for many years to come. Laura Clare created gorgeous centerpieces and selected linens that tied the tabletops into the room decor perfectly. I cannot express my gratitude enough for assuring that our vision for Jillian’s special day was carried out throughout the event. In fact you managed to exceed our vision! It truly was so beautiful and magical. Jillian was so so pleased with how everything looked. Huge thanks to Ira Casel for sharing such beautiful photos of the day! We've done creative Bar Mitzvah centerpieces for many years for a variety of themes. We often create centerpieces for a "Favorite Things" theme, where each table reflects a hobby or interest of the celebrant. For this event, we had a fun and challenging opportunity to make centerpieces for a very sweet boy with autism. He has a diverse set of hobbies and favorite things, including travel, chocolate, gymnastics, penguins, Dr. Seuss, and much more. • Light Levels: The overall light level in the room should not be too low. We used colored uplighting around the room to introduce color, and pin spotting to highlight the centerpieces. We also used the in-house lighting, which was dimmable, to create a light level that's comfortable but not too bright. • Kinetic Elements: Each centerpiece should be safe to touch and interact with. When children communicate less verbally, they experience things more kinetically. We chose elements that were safe to touch and play with, and included moving parts to make the centerpieces more experiential. The guests loved walking around each table, taking in the details that make each centerpiece special. • Color and Variety: We used a wide variety of colors to make the tabletops festive and fun, and more appealing to children. Traditional centerpieces are often very cohesive, and we went in the opposite direction to make them as individually unique as possible. • Creativity: His interests were not only unique, but also very specific. For example, he loves one specific type of interactive fountains. They're the kind you find at boardwalk amusement areas where water comes up from holes in the ground. We used a variety of materials to convey this concept without using water. We thoroughly enjoyed finding ways to visually represent these interests. We so enjoyed the opportunity to create such meaningful decor to celebrate a family's very special day. We look forward to participating in autism-friendly events in the future. The guest of honor loves chocolate, specifically nonpareils, also known as Sno-Caps. We had lots of fun creating custom extra-large nonpareils to represent his favorite candy. The family had recently taken a safari trip, so we gathered our safari animals to represent their vacation experience. This interactive basketball centerpiece has a rotating foundation with four mini basketball games for guests to play. The guest of honor loves basketball, but it was emphasized that he loves playing it, not watching it on TV. We made sure that this centerpiece reflected that. A huge thank you to Rich Schaub Photography for sharing such great photos. All content is the property of Eggsotic Events, LLC and may not be used or reproduced without permission.